Adeline Lange spins the wheel at the UHonor event at the Patio on Wednesday. 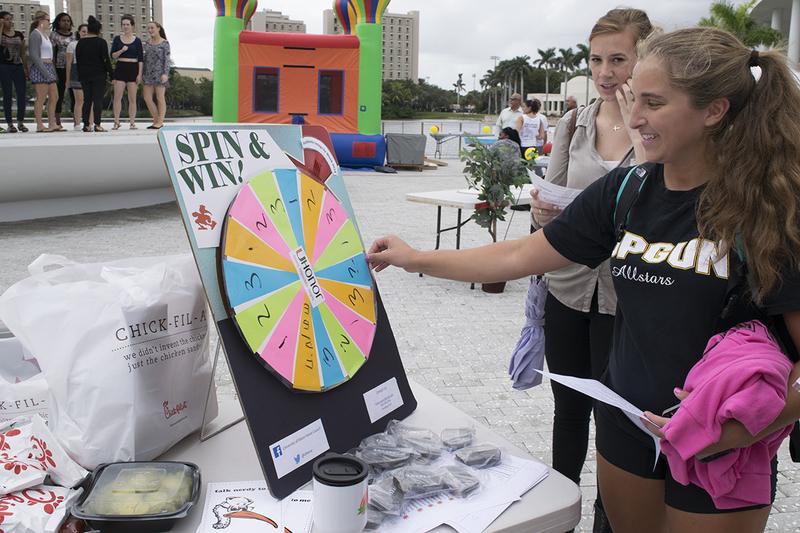 UHonor was tabling to promote academic integrity across campus. Beaux Arts, a partner of the University of Miami’s Lowe Art Museum for 63 years and the museum’s founding support group, donated $1.5 million to the museum. The endowment was given in order to create a Beaux Arts Director position and a Chief Curator position at the Lowe. The gift will also support programming, community outreaches, facility upgrades and other projects at the museum. A colored image of a pea aphid embryo taken by Hsiao-Ling Lu at the University of Miami Imaging Core facility received an honorable mention in the 2014 Nikon Small World: Photomicrography Competition. The competition recognizes the best photographs displaying the beauty and complexity of life. University of Miami alumnus James Hoffman pledged $50,000 to the School of Communication. The gift will create the James Hoffman Family Endowed Speaker Series in the School of Communication and will fund an annual lecture on the First Amendment. Follow two undercover cops as they make their way through high school once again in the film “22 Jump Street,” which will be screening at the Cosford at 9:30 p.m. Saturday. The movie, featuring Jonah Hill and Channing Tatum, is full of laughs, shadowing the two partners as they experience an array of challenges while on duty. Admission is free for all students with a Cane Card.